The Dorset & Somerset Canal was planned to connect the Bristol and English Channels and to connect the counties of Dorset & Somerset into the canal network. It was intended to be built from Bradford on Avon, near Bath, to Poole, Dorset. 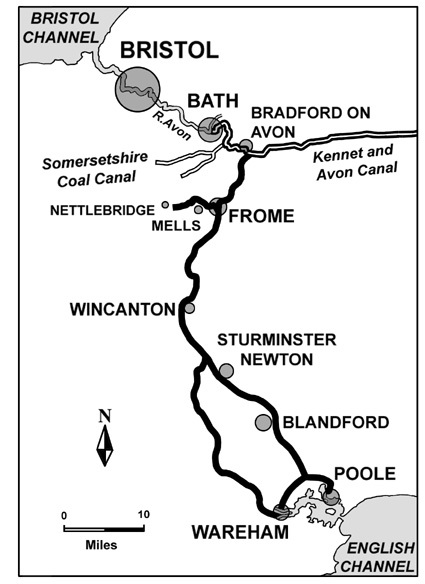 The main line was planned to run from the Kennet & Avon Canal, southwards through Frome, Wincanton and Blandford to Poole. An alternative, via. the Piddle valley to Wareham, was considered. A branch line was planned to run westwards from Frome up the Mells Valley, via. Vobster and Coleford to Nettlebridge (on the Fosseway, now the A367). A route was authorised by an Act of Parliament in 1796 from Bradford-on-Avon, only as far as Shillingstone, but including the 11 mile branch from Frome to Nettlebridge. Work commenced on building some 8 miles of this branch but it was never completed. The main trade was to be coal from the Somerset collieries and clay from Dorset. During the construction period it was badly affected by unplanned factors. The costs had been underestimated, insufficient funds raised and inflation (because of the Napoleonic Wars) devalued the company's capital. After unsuccessfully trying to raise more funds in 1803, work was finally abandoned. It is believed that only one contractor's boat ever used the canal. The Nettlebridge branch was planned to have boat lifts instead of locks, one balance lock was built by James Fussell as a trial. Recently the site of Fussells Trial Balance Lock has been located and excavated.